Happy Thursday! Welcome to another Three Clover Thursday Challenge, Kerry issued the following challenge for this week, create a Christmas card that has no red or green. Easy right? Wrong! I'm more of a traditional red/green stamper when it comes to creating my Holiday cards, so this one was quite a challenge! But, it's challenges that make us grow and become more creative as stampers, so here's my take on this weeks challenge. I had some leftover card stock cut from last years Christmas Card classes, so I went there first for my inspiration, and lucky me! I had some Baja Breeze and Chocolate panels all ready to go! I embossed the Baja Breeze panels with the CuttleBug Snowflake Folder, then using the CuttleBug Highlights Technique, I added some Brillance Silver to the raised areas. I sponged all Baja Breeze panels with Soft Suede Ink, and distressed both the Baja Breeze and Chocolate Chip panels. The beautiful present comes from Kitchen Sink Stamps Multi Step Gift plate. 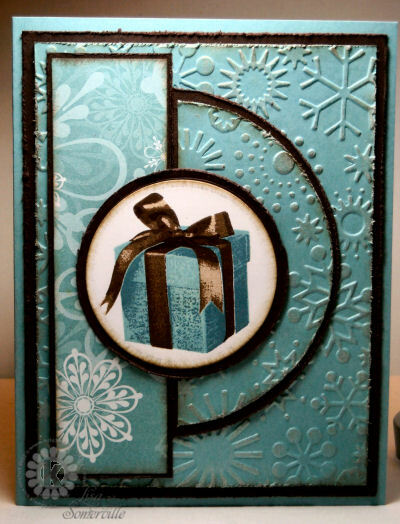 Keeping with the colors of my base card and panels, I stamped in shades of Blues and Browns, cut with a Spellbinders Circle Die, sponged the edges, and layered on a distressed Chocolate Circle, then to my base card. I left off the sentiment, as this card can now be used for the Holidays or a Winter Birthday. Looking for more inspiration? Click on the Threes Clovers Challenge Logo on my sidebar to see what Kerry and the other Challenge Players created this week. This gets an ohhhh and ahhhh, how beautiful and clever! Stop making me want some Kitchen Sink Stamps! I love this card! Great color scheme! LOVE the layout!! And you always ROCK these Kitchen Sink Stamps!! Wow! The ribbon looks like it is shining. The whole card is Wow! there you go with my favorite colors!! You did an awesome job not using red/green, these colors are very rich looking for Christmas. Fabulous! Love the rich feel of this card (those colors work well together) and I hear you - it was a "challenge" for me too but I think you pulled it off fantastically. CU-UTE! I really need to get that snowflake EB! Bautiful card, Lisa! I really like that color and the embossing looks wonderful! hugs! I kept staring at this card...it just has that something "extra" that makes it so pretty!